The first solo album by former Royal Hunt vocalist D. C. Cooper, this is quite a strong release. 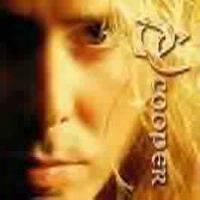 Some of the material on here could easily have been done by his former band, but Cooper also brings in some more `80`s tinged metal influences. Without a doubt, Cooper's voice is one of the best in the business, and would make any album a must listen. Cooper's band on this disc is Alfred Koffler, Tore Ostby, Dennis Ward, Kosta Zafiriou and Guenter Werno. Fast paced Rycheian guitar frenzy begins this number, and the arrangement is essentially in that vein with the addition of a more `80`s styled metal chorus section. Lyrically, this one seems to be about someone who took his own life and wants a dream to remind someone left behind of him. "On the days when I'm hating life, I'll never know why, Seems there's too much to remember, Leading to my final goodbye." "If the dream will blind you, Will remind you, of me when I leave here, A dream reminds you, Always shines through, Show the light that took me from my tears." This is a strong cover of the classic Uriah Heep cut. It is a bit heavier rendition than the original. Cooper's powerful voice really works well on this number. Dramatic keys and a strong arrangement bring this cut in. Royal Hunt could easily have done this one. It is a strong prog metal number with the emphasis on the metal. The composition ends with tolling bells and footsteps that walk into the next cut. Starting with evocative vocals accompanied by mild percussion and keys, this one jumps gear as the metallic guitars come in. The verses are more in the keys/vocals style with the choruses set in a potent arena ballad mode. Featuring a great dramatic and progish bridge, this is another cut that could easily have been done by Royal Hunt. Fast paced and frantic, this is good progish metal. More `80`s mainstream metal sounds make up the basis for this one, although it is very crunchy. The song deals with violent behavior being passed from generation to generation and how it ruins lives. It does get dramatically progish from time to time, particularly in some of the rhythmic patterns and the guitar solo. Beautiful and evocative, this instrumental features some awesome keyboard work. Another cut that is very much in the vein of Royal Hunt, this is a strong metal song in the tradition of the more powerful straight-ahead metallic rockers. It features some solid guitar work and a potent arrangement. Starting in a rather neo classical mode, this one alternates between that style and a very crunchy, fast paced metal cut. The dynamic range provided by the two extremes is quite effective at creating drama and power. This cut features some very progish moments. A hard-edged prog metal intro drops into a more laid-back verse segment. The song alternates between those two styles being quite progish and dramatic at times. This is a very strong prog metal tune with wonderful tones and a strong arrangement. Starting with strong acappella vocals, dramatic and metallic guitar joins in, and the arrangement starts to build featuring evocative piano, keys and vocals. It suddenly burst forth in balladic metallic power. Next comes a progish piano based segment with an intriguing vocal arrangement. This leads to a short Dream Theaterish segment which gives way to a more straightforward metal mode. The cut then drops back to a piano based segment with female vocals for one verse. The ensuing instrumental break is metal edged prog at its best. The tune then takes on more conventional arena rock concepts and features a very tasty guitar solo and a great, almost Yesish section. This is a killer number that covers lots of musical territory. It eventually drops down to an acoustic driven mode that includes a powerful vocal arrangement.